Leftover Salmon is a genre-bending band from Boulder, Colorado. Their unique blend of bluegrass, rock, country, and Cajun/Zydeco, which the band calls "Polyethnic Cajun Slamgrass", has found favor with the jam band scene. The band formed by accident in 1989 (see 1989 in music), when a local band, the Salmon Heads, asked some members of the Left Hand String Band to fill some missing spots in its lineup. The synergy worked and the result was Leftover Salmon. 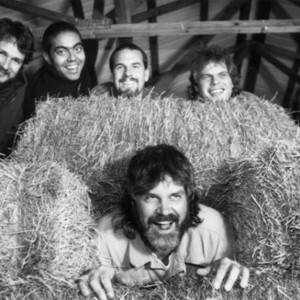 The band formed by accident in 1989 (see 1989 in music), when a local band, the Salmon Heads, asked some members of the Left Hand String Band to fill some missing spots in its lineup. The synergy worked and the result was Leftover Salmon. After the independent release of Bridges to Bert in 1993 (see 1993 in music) and the 1995 (see 1995 in music) live follow-up Ask The Fish, Leftover Salmon gained a spot on the H.O.R.D.E. festival tour and a contract with Hollywood Records. Their 1997 Hollywood debut and second studio album, Euphoria, continued to define their eclectic sound and introduced many songs that would become classics for the band. In March of 2002 (see 2002 in music) founding member and banjoist Mark Vann lost his battle with cancer. He was later replaced by Noam Pikelny. A documentary film of Leftover Salmon, titled "Years In Your Ears," was released on DVD in November 2006.